I love this salad. Like, so much that I made it yesterday and I am eating the last of it as I write. The recipe makes enough for 8-10 servings, you guys. I mean we did have it for dinner last night and my husband took some for lunch today but seriously, me, pull yourself together. About five years ago a client of mine gave me a bag of amazing, beautiful wild rice that was grown on her family’s farm…and she included a recipe very similar to this one with it. It is an awesome recipe and I have been making it regularly ever since then but just last night I decided to turn it Asian. Why, you ask? Apparently you are unaware that I was born in Thailand in my past life and love and adore anything with Asian flavor..hence, why I am able to eat enough servings of this stuff to feed a small country. I will never make it the old way again…it’s seriously craveable. Note: this salad gets better with age so make it in advance if you are able. Cook wild rice according to package directions substituting chicken stock for half the amount of water recommended. Make vinaigrette: In a small bowl combine garlic, vinegar, olive oil. sesame oil, dijon, agave or honey, salt and pepper. Whisk until well combined. 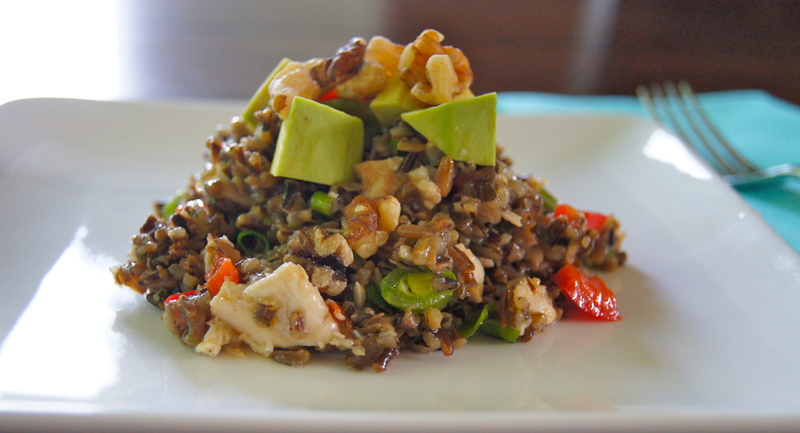 Make salad: Combine chicken, wild rice, red pepper, snap peas and green onions in a large bowl. 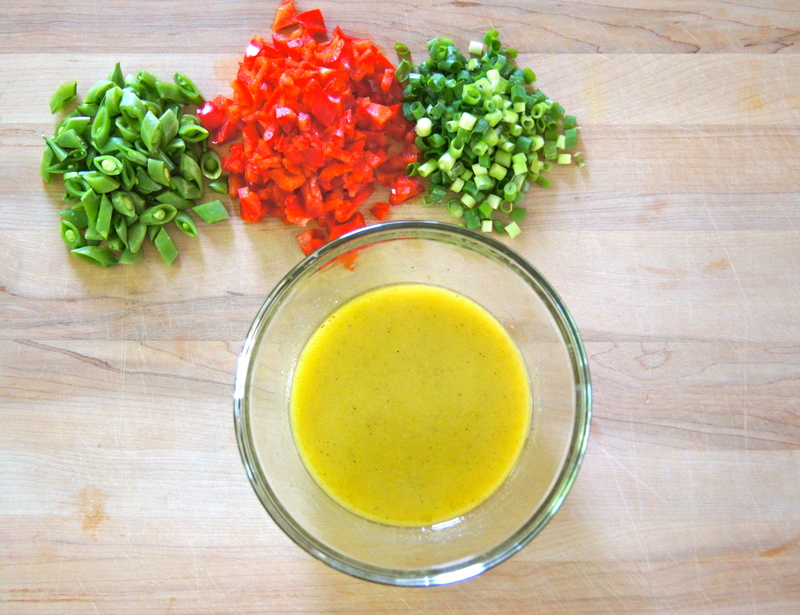 Pour vinaigrette over and mix to coat well. Chill. Serve topped with diced avocado and nuts, if desired. Makes 8-10 servings. Made this tonight and have it all packed for my lunch tomorrow. Can’t wait to try it out!